Foreign issue football sticker by DS under the Euro 96 series. Measures approximately 4.8 x 7cm. 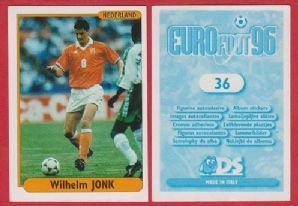 Depicting the Holland star Wilhelm Jonk, who played for P.S.V Eindhoven, Ajax, Volendam, Inter Milan and Sheffield Wednesday. © Copyright Premier Football Cards All rights reserved.